That's what fiction is for. It's for getting at the truth when the truth isn't sufficient for the truth. Howdy, and welcome to today’s edition of the University Writing Center’s Write Right screencast series. Today we will outline various strategies for sentence variation and discuss the motivations behind them. First, what do famous writers think about sentence variation? The English language has potential for great variation and creativity, so we want to exercise that by expressing our ideas in an engaging manner that mimics the way we speak with one another. So, why should we vary sentences in the first place? Too many sentences of the same length and pattern can become monotonous and boring for readers so we want to maintain their attention and create a rhythmic flow that is pleasing to the ear. Varying sentences can also reduce complexity, emphasize a certain idea, emphasize the subject or predicate depending on your field, and eliminate repetition that will dull the reader’s interest. Today we will highlight three major strategies for varying sentences. The first is variation of three major sentence pattern types using punctuation, connectives, and the order of independent and dependent clauses. 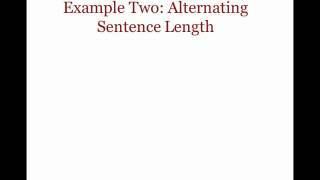 The second is the alternating of sentence length and the third is the use of diverse sentence beginnings instead of repetitive introductions. The first sentence pattern type is the most common, the simple sentence. It contains only a single independent clause or a subject and predicate that can stand on their own. The next strategy is the alternation of sentence length between short and long. Long sentences tend to be effective for communication a lot of information, while short sentences can summarize main ideas. Adopting a healthy variation of the two will allow the writer to emphasize crucial points or breathe life that otherwise sound dull or blending together. As you can tell, this sentence doesn’t flow particularly well. The reader will grow tired of reading such lazy writing, so keep the attention fresh by varying the sentence introductions. Also, if the writer sentences changes their sentence opening, rephrasing of sentences before or after the revised sentence may be required. So variation as something as simple and minor as the introduction to a sentence can lead to a chain reaction of variation across an entire paper. In conclusion, sentence variation is a useful strategy for maintaining reader attention, clearly organizing ideas, expressing relationships and emphasizing specific elements of a sentence. Also, remember that writers do possess a great deal of freedom in expressing ideas in the clearest manner possible. Remember to visit writingcenter.tamu.edu for more information and to book an appointment with one of our trained consultants. Have a nice day.